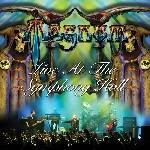 15 track live album recorded at the Symphony Hall Birmingham, their home town! More information: Magnum release a 15 track live album – Majestic Hard Rock at it's best, recorded at the Symphony Hall Birmingham, their home town. It was the final gig of "Road To Eternity" tour, recorded on 19th April 2018. Spurred on by their audience’s raucous cheers, Magnum entered a sort of playing frenzy, intoning hits like ‘How Far Jerusalem’, ‘Vigilante‘, ‘Don`t Wake The Lion (Too Old To Die Young)‘ or ‘The Spirit‘ and proving without a shadow of a doubt that the newer songs from their 2018 studio album Lost On The Road To Eternity, namely ‘Peaches And Cream‘, ‘Show Me Your Hands‘, ‘Lost On The Road To Eternity' and ‘Without Love' also make for absolute terrific live performances at rock anthem level. Star guest Tobias Sammet (Avantasia, Edguy), too, was swept along by this enthusiasm and the blazing interaction between the musicians and their Birmingham audience when he went on stage for ‘Lost On The Road To Eternity’ to lent energetic support to vocalist Bob Catley just like he did for the track’s studio recording.